Many people believe the lie that homeschooling is just easy for those who do it. Sometimes I believe it too. But it really is a lie. Just like any job, sometimes homeschooling is just plain hard. Sometimes it’s really hard. 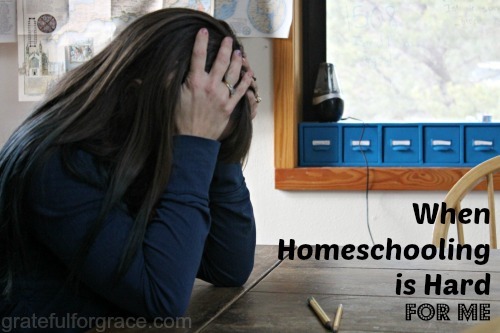 Every homeschool mama has different reasons for why. For me, it’s all about me. Homeschooling is hard for me when things don’t come easily. For the kids. Yup, how incredibly selfish is that of me? Pretty stinkin much, actually. I know. But I get weary of hearing “Homeschooling isn’t for me because I don’t have the patience”. Well… most of us don’t. I am faced with my impatient heart often. When Esther asks again and again and again how to do long division, despite my explanations and the little sign posted by the computer to trigger her memory. Even when she cries, tears streaming down her face because she is scared and frustrated with something she think she can’t do. I get aggravated. Sigh. Horrible, aren’t I? That’s when it’s hard. Hard because it takes more time, because I have to teach something for the billionth time to the same child, because my agenda, whether an actual agenda or an emotional one, isn’t getting done. When Phoebe writes sentences with random letters capitalized and no punctuation in sight. Even though we’ve worked on it and worked on it and I’ve said it until I’m blue in the face. I get aggravated and embarrassed that she doesn’t retain the information, making me look bad. In my own eyes and possibly in others. Sigh. Horrible, aren’t I? That’s when it’s hard. Hard because my students don’t do tasks perfectly so they don’t make me look like the perfect teacher, because I’m not. When every single child in my home delays doing their work for a plethora of reasons. Even though we have a schedule and a routine and they know what they are supposed to be doing. Every single day. I get aggravated and frustrated that I have to tell the what to do and have to remind them and have to work. Instead of doing whatever I want to do. Sigh. Horrible, aren’t I? That’s when it’s hard. Hard because my heart would rather stray from my tasks and play. On Facebook. On Instagram. On whatever. There are lots of other reasons that homeschooling can be hard for me (getting up in the morning would be the first one), but honestly the biggest hurdle in homeschooling… is me. My selfish heart. My lazy body. My prideful spirit. God has done great works in me, no doubt. But this struggle seems to be consistent. Sad part is that I think it’s actually gotten worse over time. The whole, “I’ve been doing this awhile and you’ve been doing this awhile, so come on…. we should have this” gig increases the struggle. God will keep refining me, no doubt. I am grateful that my heart is pricked when I have a bad attitude and when I need to die to self to help my children grow, learn, or be encouraged. The whole, “This isn’t about you, but it’s about you” gig increases my growth. God gave us this gift of homeschooling, no doubt. He gave it to a girl who was selfish, and impatient, and prideful, and oh so not perfect. He didn’t give it to a woman/mom/teacher who had it all together. The whole, “You can do this through Me, Mindy” gig is important. I need more grace and I need to give more grace. Oh the irony of my blog title. So…. homeschooling is not easy. Not for me. Not for most. Don’t buy that lie. But nothing really worth doing is easy, is it? How is homeschooling hard for you? Next post: Someone in Our House Really Shouldn’t Back Up Vehicles. Pretty Much Ever.